Confronting Major Depressive Disorder (MDD), often simply called depression, is the theme for this year’s World Health Day on 7 April. MDD is a mental disorder characterized by at least two weeks of persistent sadness and a loss of interest in normally enjoyable activities accompanied by an inability to carry out daily activities. “Let’s build a more humane society to prevent depression, putting people over profit. 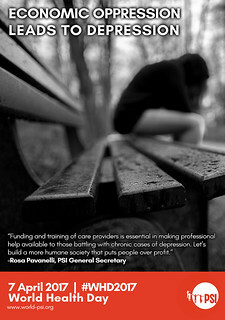 Greater concern for mental health, including funding and training of care providers is essential in making professional help available to those battling with chronic cases of depression”, says Rosa Pavanelli, PSI General Secretary. People with depression often suffer from one or more of the following: low self-esteem, loss of energy; change in appetite; sleeping more or less; anxiety; reduced concentration; indecisiveness; restlessness; feelings of worthlessness, guilt, or hopelessness; and thoughts of self-harm or suicide. The causes of MDD are largely unknown however vulnerability to this condition is believed to be a combination of genetic, environmental and psychological factors. The pressures of work and the ever-expanding precarious forms of work predispose millions more people to suffering from depression now than ever before. Every 40 seconds, someone dies by suicide. Of those, 60% suffered from depression or other related forms of mood disorder. Post-natal depression affects one in every six women after childbirth. This can be treated with professional help. Talking and caring by family, friends and colleagues is also invaluable at such moments. Working in the health and social care sector, education, emergency and security services, is highly labour intensive and entails personal relations, including physical contact, with users. This can be a fundamental factor of stress, sometimes leading to mental health issues, depression and burn-out for many professions in public services, (e.g. nurses, doctors, firefighters, teachers, carers, prison guards and also labour and tax inspectors). The responsibility for human lives is an important stress- related cause often ignored by employers and users. And finally, public services workers are subjected to third party violence more than in other sectors. Important consequences of occupational health and safety risks in the health workplace are absenteeism and resignation, which then acutely or chronically worsen healthcare worker shortages and overload, compounding the problem and further lowering the quality of health services. Yet it has been shown that adapted ratios of patients to healthcare workers, or patient quotas, greatly improve the working conditions of healthcare workers and the resulting health outcome for patients. Trade unions support workers against work-related stress and depression first by defending the right to collective bargaining on training, working conditions, prevention of accidents and diseases and on occupational safety and health. Secondly, by lobbying governments to stop cutting public spending and investing in quality public services instead. Thirdly, by trying to involve users, citizens and communities to recognize and appreciate the fundamental role of public services workers in protecting people and the environment, in serving the general interest instead of profit and defending everybody’s well-being. Different networks of trade unionists, citizen collectives, NGOs and social movements have planned a series of actions in several European cities this World Health Day (Friday 7 April 2017). A rallying cry will be heard from activists in Madrid, Barcelona, Zaragosa, Paris, Nice, Brussels, Milan, Florence, Bologna and many other cities across Europe (see map of actions). Our message is simple: governments should invest more in quality healthcare for all and stop considering health as a commodity. OUR HEALTH IS NOT FOR SALE!